The latest episode of URI Today travels to the southernmost and westernmost point of Rhode Island to Napatree Point Conservation Area, located in the village of Watch Hill, in Westerly, RI. This sandy peninsula separates Narragansett Bay and Block Island Sound. It is a favorite area for bird watching, boating, swimming and long walks 12 months of the year. It is also an "outdoor classroom" for University of Rhode Island researchers, who are keeping an eye on what is referred to as "one of the most pristine barrier beaches" in the state. Journey with faculty and staff as they conduct studies on everything from dune grass plantings and horseshoe crab tagging to weekly water quality sampling. Viewers will see Napatree through a scientist's eye and learn why more than 30 studies are being conducted along the shoreline during the day and under the stars. 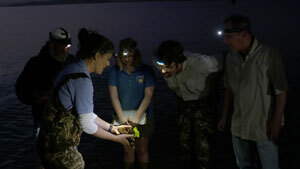 Rhode Island PBS presents URI Today: Napatree Point - URI's Outdoor Classroom on Thursday, February 25 at 9 p.m.